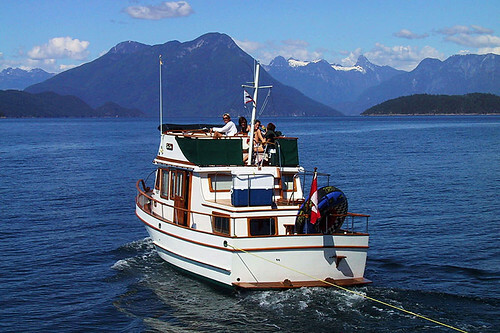 Most yachtsmen regard Desolation Sound Marine Provincial Park as the most beautiful cruising ground in British Columbia, and one of the premier sailing playgrounds in the world. Sixty miles of breathtaking coastline, intricate waterways, small islands and numerous attractive bays and coves, nooks and crannies – enough to delight even the most demanding of adventurers. Only your time and imagination will limit the endless variety of places to discover and activities to pursue in this unforgettable marine park, the largest in BC. One of the prime attractions of these waters is their warmth in summer months, which makes them ideal for swimming, snorkelling and scuba diving. Camping areas ashore abound, and the forested parkland comprises extensive trails and small lakes. 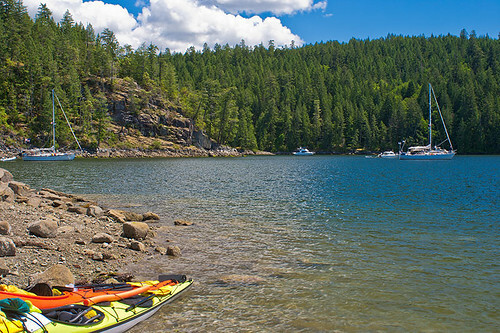 Desolation Sound is a fantastic area for sea kayaking. A virtual absence of development in the 8,449-hectare park area provides visitors with almost total isolation in this protected, wilderness environment. Visitors should be well prepared and self-sufficient. Campers should follow proper backcountry travel procedures to secure food from animals. The scenery of Desolation Sound Marine Provincial Park is less severe than many of the other sheer-sided waterways along the central coast, although just as majestic. Set back from the park to the north, east and south are the snowcapped peaks of the Coast Mountains that soar from the tideline to heights of 2,400 metres. 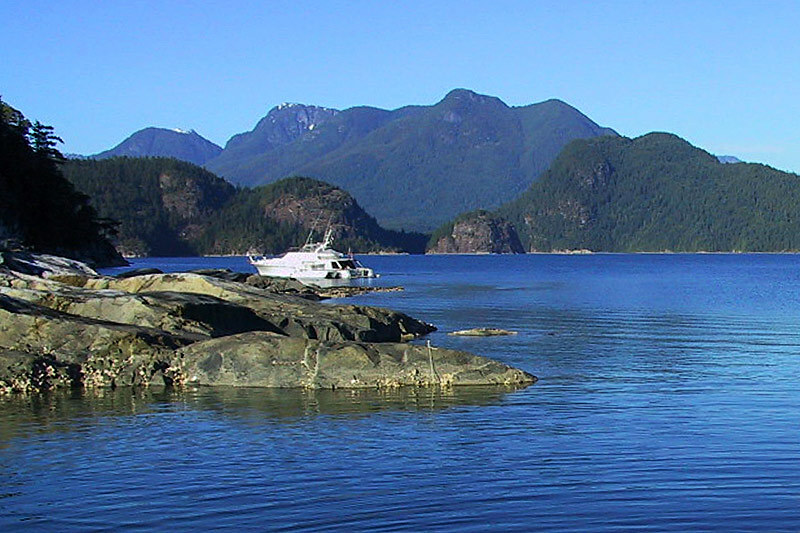 A long and narrow sheltered bay located on Gifford Peninsula in Malaspina Inlet. The inner part of Grace Harbour is completely protected from all winds and seas. There are a few wilderness camping spots at the end of the bay, and a series of hiking trails. Follow the trail at the northern end of the harbour to a small, peaceful, freshwater beaver lake. Facilities include pit toilets and an information shelter. Galley Bay and Isabel Bay or other bays provide anchorage for cruising boats and landing spots for kayakers wishing to explore ashore or set up camp for the night. Thors Cove is outside the Park – with a southeast wind blowing up Okeover Inlet and out Malaspina, this same wind will blow up Lancelot Inlet as a southerly and almost diretly into Thors Cove as a westerly. The best protection in these circumstances can be found in the extreme south end of the cove or directly behind a tiny inlet near the south end. The current runs quite quickly through the narrow twisting channel which opens up inside Theodosia. Theodosia Inlet is almost a lagoon – good anchorage is available throughout the Inlet as well as behind this islet. Several temporary anchorages are possible near the head of Wootton Bay with goood protection from the nightime westerly but somewhat exposed to anything from the south or southeast. Mink Island is outside the park boundaries but is still a very popular anchorages in Desolation Sound. The outer anchorage is fairly deep and completely open to the east. Shallower, more protected anchorage is possible behind a small islet near the head of the cove. Bold Head shelters this beautiful bay south of Prideaux Haven, in Homfray Channel. Favoured anchorages in Tenedos Bay are inside the island on the bay’s northern shore, or at the head of the bay, near Unwin Lake. A pleasant stroll along a trail leads to Unwin Lake, an ideal fresh and warm water swimming spot. Facilities include campsites, pit toilets and an information shelter. Kayakers and campers can explore nearby Mink, Curme and Otter Islands. Strategically located as a base for boaters to explore the Sound, this anchorage is an elongated bay dotted with islands, small coves and passageways. 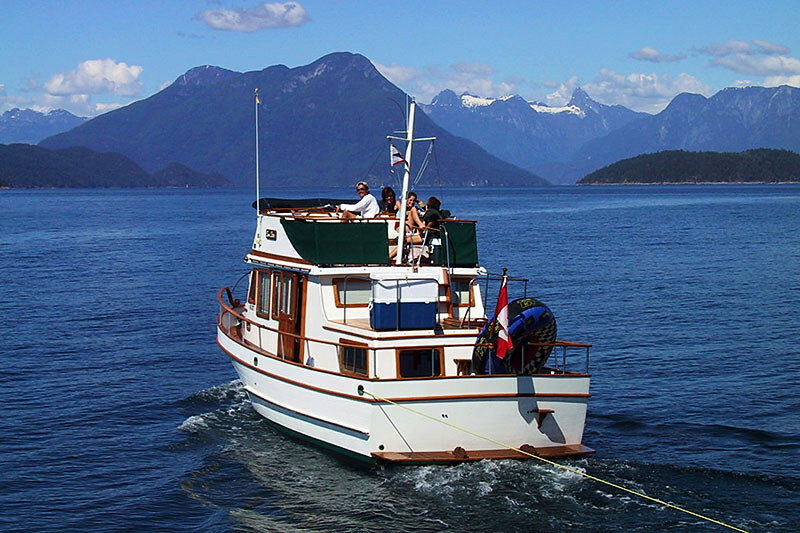 Prideaux Haven is one of the most beautiful anchorages in Desolation Sound. This is a marvellous place to explore by kayak, paddling among small coves, inlets and islands. Ashore, interesting tidal pools and marshes will enthral you with an abundance of marine organisms, birds and waterfowl. Melanie Cove and Laura Cove are favoured anchorages for boaters, although anchorage is available at a number of locations along the shoreline. Boaters and paddlers will discover an environment nearer in spirit to the protected waters of the southern Strait of Georgia. What Desolation Sound Marine Provincial Park provides that the Southern BC Gulf Islands don’t provide, is an astonishing breeding ground for tasty shellfish, principally oysters. Whoever penned the time-honoured expression “When the tide is out, the table is spread” must surely have been inspired by the nutrient-rich, productive waters of Desolation Sound. Because of pool tidal circulation, the anchorages of Desolation Sound Marine Provincial Park are no-discharge zones; visitors must use holdings tanks or shoreside facilities where available. Boaters should also bring their own drinking water and boil any surface water prior to consumption. The park contains several parcels of private land. Kayakers should note in particular that the land at the head of Portage Cove is private, and there is no access across the Gifford Peninsula at that point. There are two approaches to Desolation Sound, either from Lund or nearby Okeover Arm Provincial Park at the head of the inlet. A boat ramp is located at each location. Paddlers will find less marine traffic in Okeover Inlet than along the west side of Malaspina Strait. Desolation Sound Marine Provincial Park is located north of Powell River and Lund on the Sunshine Coast, 90 miles (144 km) north of Vancouver, British Columbia.